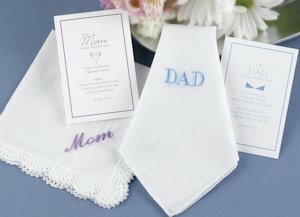 Present your mom and dad with a timeless keepsake on your wedding day. Each handkerchief comes boxed along with a touching verse about being a parent of the bride. The Dad handkerchief measures 16" x 16" and is embroidered in blue. The Mom handkerchief measures 12" x 12" and features crocheted lace and lavender embroidery. Let them know how much it means to you that they are sharing in your special day.